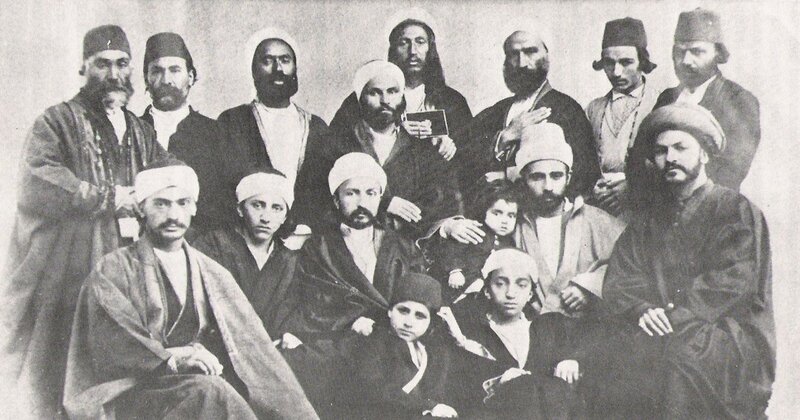 The family of Bahāʾ-Ollāh (also Baháʾuʾlláh, born Mīrzā Ḥusayn-ʿAlī Nūrī, 1817–1892), the prophet-founder of the Bahāʾī faith intermarried both with the family of his predecessor, Seyyed ʿAlī Muḥammad Shīrāzī (1819–1850), known as the Bāb (or Báb), as well as with the families of many of his early followers. The issue of genealogy played an important rôle in the early legitimation of the Bahāʾī faith, which claimed to fulfil the millenarian prophecies of prior Abrahamic faiths. Bahāʾ-Ollāh declared himself to be the ‘Promised One’ of prior religions, in particular the return of the Hidden Twelfth Imām of Shīʿī Islam. Thus, Bahāʾi theology emphasised his genealogical connexion to the family of Muḥammad and ʿAlī, to the Biblical House of David, and even the Sāsānian dynasty of pre-Islamic Iran (r. 224–651). As the Bahāʾī faith developed, the importance of lineage continued, as the leadership of the religious movement passed from Bahāʾ-Ollāh to his eldest son, ʿAbd ol-Bahāʾ (also ʿAbduʾl-Baháʾ, born ʿAbbās Efendī, 1844–1921), and later to his great-grandson, Shoghi Effendi Rabbani (Showqī Efendī Rabbānī, 1897–1957). This feature received greater attention as their relatives challenged and opposed the Bahāʾī leaders in each generation. The genealogy charts provided here aim to illuminate further the aspects described above. The first chart depicts the full genealogy of the Bahāʾī holy family as descended from the royal dynasty of the Qājār family, which ruled Iran from 1795 to 1925, through the father of Bahāʾ-Ollāh, Mīrzā ʿAbbās Nūrī (known as Bozorg-e Vazīr, d. 1839), down to the present day. This chart includes all descendants of Bahāʾ-Ollāh, as well as of his younger brother Mīrzā Yaḥyā Nūrī (known as Ṣobḥ-e Azal, 1831–1912), who broke with Bahāʾ-Ollāh together with his family, and the families of ʿAbd ol-Bahāʾ’s full and half-siblings. Note: There is a problem with your flash settings which prevents you from seeing the interactive version of this chart. To view this chart, click here. This second chart (or set of three family trees) depicts the descendants of Bahāʾ-Ollāh through each of his three wives, Āsiyyeh Khānom, Fāṭemeh Khānom, and Gowhar Khānom. Click on each of the images to enlarge them. Āsiyyeh Khānom (also Ásíyih Khánum, known as Navāb, 1820–1886) married Bahāʾ-Ollāh between 24 September and 22 October 1835, becoming his first wife. She mothered seven children, although only three survived to adulthood: Bahāʾ-Ollāh’s successor, ʿAbd ol-Bahāʾ (also ʿAbduʾl-Baháʾ, born ʿAbbās Efendī, 1844–1921), Bahiyyeh Khānom (also Bahíyyih Khánum, born Fāṭemeh Khānom, 1846–1932), and Mīrzā Mehdī (also Mírzá Mihdí, 1848–1870). Mehdī occupied a special place in Bahāʾī theology and received the title of the Purest branch (Ar. al-Ghuṣn al-aṭhar); his death in 1870 from a fall through a hole in the roof of the Ottoman prison in which his family was jailed immortalised him as a martyr for the Bahāʾī cause. Bahiyyeh Khānom never married, leaving ʿAbd ol-Bahāʾ as the only of Āsiyyeh’s offspring to continue her lineage. Fāṭemeh Khānom (also Fátimih Khánum, known as Mahd-e ʿOlyā, 1828–1904), a cousin of Bahāʾ-Ollāh became his second wife in 1849 after widowing her first husband. Four of her children with Bahāʾ-Ollāh survived to adulthood: Mīrzā Moḥammad-ʿAlī (also Mírzá Muḥammad-ʿAlí, 1853–1937), Ṣamadiyyeh Khānom (also Ṣamadíyyih, 1857–1904), Mīrzā Żīyāʾ-Ollāh (also Mírzá Ḍíyáʾuʾlláh, 1864–1898), and Mīrzā Badīʿ-Ollāh (also Mírzá Badíʿuʾlláh, 1868–1950). Together with their mother, they opposed ʿAbd ol-Bahāʾ and his grandson Shoghi Effendi, becoming ‘Covenant-breakers’ (Ar. nāqiḍayn al-mīthāq) for breaking with Bahāʾ-Allāh’s testament. Gowhar Khānom (also Gawhar Khánum, d. 1898) married Bahāʾ-Ollāh after serving as the maid of his first wife, Āsiyyeh Khānom, and bore him one child, Forūghiyyeh (also Furúghiyyih, 1873–? ), who married into the extended family of the Bāb. Gowhar and all of her descendants became Covenant-breakers following the death of Bahāʾ-Ollāh. The marriage of Shoghi Effendi’s sister Rūḥāngīz Rabbānī (also Rúḥángíz Rabbání, 1902–?) to Nayer Afnan (Nayyir Afnān, 1894–1952), the son of one of ʿAbd ol-Bahāʾ’s vocal adversaries, led to a series of confrontations and challenges that resulted in the excommunication of the remaining members of the family from the Bahāʾī faith. The third chart depicts the descendants of ʿAbd ol-Bahāʾ through his only wife Monīreh Khānom (born Fāṭemeh Nahrī, 1847–1938), whom he married in 1873. Of their children, only four daughters survived to adulthood; ʿAbd ol-Bahāʾ appointed his eldest grandson, Shoghi Effendi (Showqī Efendī Rabbānī, 1897–1957), as Guardian of the Cause of God (Ar. walī amr-Allāh). Although Shoghi Effendi married Rūḥiyyeh Khānom (also Rúḥíyyih Khánum, born Mary Sutherland Maxwell, 1910–2000) in 1937, they never had any children. Since the remainder of Shoghi Effendi’s family had been declared Covenant-breakers by the time of his death in 1957, this left virtually no followers of the Bahāʾī faith from among Bahāʾ-Ollāh’s physical descendants. Cohen, Erik. ‘The Baháʾí community of Acre’. Folklore Research Center Studies 3 (1972): 119-141. ‘Events connected with the Holy Land and the growth of the International Center’. Baháʾí World 12 (April 1950-1954): 32-69. ‘The Holy Land 1918–1922: Some historical letters’. Baháʾí Studies Review 11 (2003): 96-99. Ruhe, David S. Door of hope: A Century of the Baháʾí faith in the Holy Land. 2nd revised ed. 2001. Reprint, Oxford: George Ronald, 2006. Taherzadeh, Adib. The Covenant of Bahāʾuʾllāh. Oxford: George Ronald, 1992. Early Bahāʾīs, including several sons of Bahāʾ-Ollāh. Source: Wikipedia. Full genealogy of the Bahāʾī holy family. Source: D Gershon Lewental (DGLnotes). Descendants of Āsiyyeh Khānom. Source: D Gershon Lewental (DGLnotes). Descendants of Fāṭemeh Khānom. Source: D Gershon Lewental (DGLnotes). 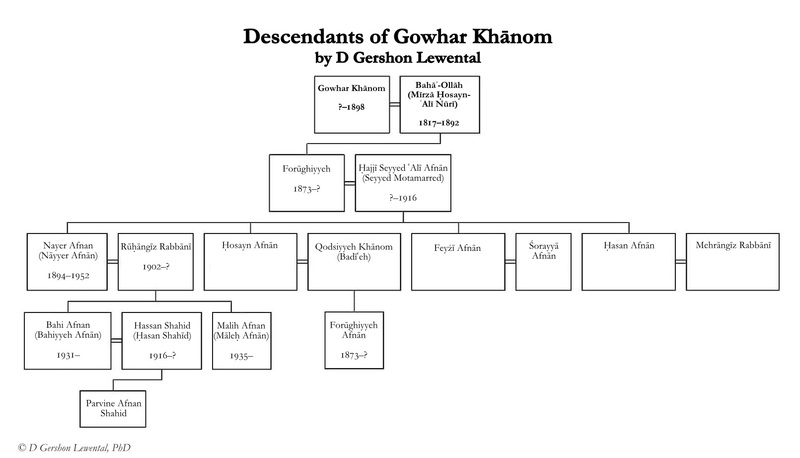 Descendants of Gowhar Khānom. Source: D Gershon Lewental (DGLnotes). Descendants of ʿAbd ol-Bahāʾ. D Gershon Lewental (DGLnotes).